PUTRAJAYA Holdings (PjH) Sdn Bhd said its next phase of development at the administrative capital will comprise commercial and residential properties worth more than RM1.3 billion. Director and chief executive officer Datuk Azlan Abdul Karim said the properties which will be built in five years, will make Putrajaya a liveable city. "The perception is that Putrajaya is for government buildings. Our next focus is to build office towers, retail, an entertainment strip and medium- to high-end housing to create vibrancy for Putrajaya. "We will have several mixed developments and waterfront projects to attract expatriates, too," he told the media in Putrajaya yesterday. Putrajaya, which started in 1995, comprise 20 precincts sprawled over 4,931ha. By 2020 it will have 3.8 million sq m of government offices, 3.4 million sqm of commercial space, and 65,000 residential units with a working population of 500,000. PjH, the master developer for Putrajaya will call for tenders for the new projects by early 2011. Some of the projects are in design stage now, Azlan said. Azlan said PjH will either lease the office towers or sell them if there is demand. He said PjH has been approached by several government agencies and corporate companies. "We aim to also attract multi-national companies. We will be talking to some big names," he said. All the buildings will meet the Green Building Index standards, Azlan said. On the residential side, he said PjH will build affordable homes starting from RM150,000, terraced houses priced from RM450,000, and waterfront villas, which it expects to sell from RM2 million. "We will cater to all segments of the market. I am bullish on the outlook for Putrajaya. There is pent-up demand for new houses here," he said. 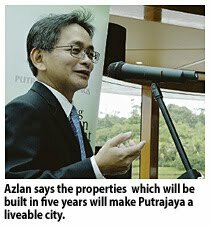 Azlan said on average, its housing projects are snapped up within one month after launch. "When we build commercial or residential properties, we will make sure there is demand. We are not going to be like Dubai where they kept on building regardless or not there was demand," he said.